In these tough economic times how can CIOs get the budget necessary to support Disaster Recovery and Business Continuity Planning. The following steps should be taken when planning a presentation seeking to gain management support of a Disaster Recovery and Business Continuity program. Define the scope, objectives, and requirement - It is not enough to have an objective of getting more funding or gaining executive support. Define exactly how much funding is needed, or exactly what form the executive support should take. Verify expectations - Define what management's expectations for the meeting are. Focus on business continuity - It makes more sense to get the commitment for resources to achieve a 24-hour recovery time objective (RTO) than to demand the resources for a two-hour RTO and get nothing. The most common risks are the mundane ones - power failures, hardware failures, software failures, network failures and human errors - and it's easier to calculate the likelihood of one of those incidents than it is to predict a natural disaster. Anticipate objections - realize that the number one objection is the cost, and prepare accordingly. Let the results of the business impact analysis (BIA) justify the "investment" (not "cost"). Prepare a competitive analysis - Executives care what their competition is doing. Annual benchmark studies and surveys are good sources of information on the investments in DPR/BCP being made by industry, by size of organization, etc. Prepare examples of what has happened to others - Remind the executives of the regulations that affect their business, and the impact of not complying with them. Examples of such regulations are Sarbanes-Oxley, HIPAA, Foreign Corrupt Practices Act, and Gramm-Leach-Bliley. In addition, research companies that have been damaged significantly in highly publicized news stories because of their failure to act responsibly. Talk to your insurance company. Insurers maintain reams of statistics about likely incidents and their associated costs to get a sense of how risky it is to insure a particular company. Your insurer might be willing to share some of that data. Check government Web sites. Government agencies will have historical data on events that have occurred in your area. The U.S. Department of Energy, for instance, provides statistics on power outages by location. The Department of Transportation keeps statistics on incidents involving hazardous materials. If you need data about incidents in other countries, one resource is the Web site of EuroStat, the European Union's official statistical agency. Define the Risk/Reward of DRP/BCP - Research and develop the business continuity program's return on investment. Package Resources - Work with vendors like Janco Associates who can package infrastructure solutions like the Disaster Recovery Business Continuity Template to accelerate the process and minimize the cost. Get buy-in for key decision makers before you meet to ask for a decision - The effort will have greater success if key decision makers and other departments within the organization support the DRP/BCP program. The power of a presentation supported by key executives, marketing, IT security, physical security, human resources, facilities, and risk management is highly significant. 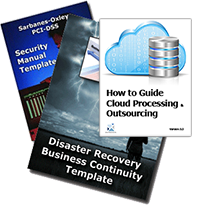 Click on the link below to get the DRP/BC sample pages now and make it part of your disaster recovery toolkit.